To those who aren’t from Seattle, the Emerald City is a rainy metropolis of coffee addicts, rambunctious 12th Man fans, and overly obstinate 90s grunge enthusiasts. While all that may be true, to those who call Seattle home, the city is so much more than that. It’s people who sport flannel and hiking shoes on the regular, choosing a well-insulated rain jacket over the tourist-beacon that is the umbrella, regardless of the downpour. It’s an eclectic group of crafters and artists, singers and musicians, chefs and farmers who all understand that community is the backbone of what Seattle is all about. It’s the scent of a campfire, the taste of whiskey on a windy day, the feeling of bundling up in cozy warm clothes after a hike up Mt. Si in the rain. Whether a local Seattleite or a visitor, everyone has a different idea of what makes this city special, and we all have different ways in which we’d like to authentically represent it. 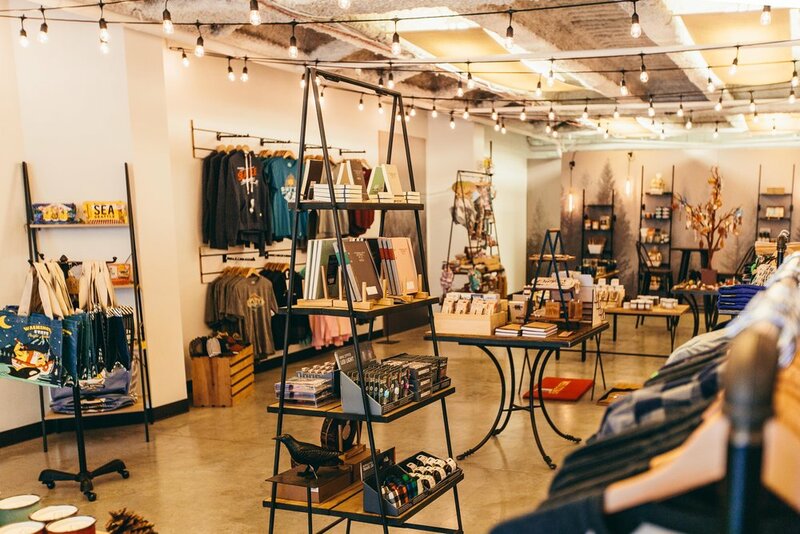 Here at Simply Seattle’s new store, the 6th Avenue Market, we hope to showcase the best of both worlds, capturing the authenticity of some of the best parts of Seattle and putting them all in one place for both tourists and locals alike. To do so, we’ve partnered with such local craftsmen as Slabart, Estrella, and Glass Eye Studio (among many others), to help us curate a specialty boutique shop that perfectly represents all the beauty, the absurdity, and the delights of the Pacific Northwest. And are you ready for the best part? We’ve included a handcrafted, custom wine bar made just for us by local artists Slab Art and Fletchers Furniture for your sipping pleasure. Here, you can grab a pour of wine, a carefully selected pairing of chocolate, and stroll about the store sipping your favorite varietal--all while you shop. Of course, you’re welcome to grab a seat and stay awhile if you need some wine after work, or buy a bottle to take back home or to the hotel. We feature a rotating menu of premium Washington wines, as well as a couple internationals, so no matter your palate we’ll have something for you. And if wine, chocolate, and PNW-inspired goods aren’t enough, we also have a large gifts department that will help construct the perfect gift basket or box for any occasion. Simply select any number of items you see in the store, pick your packaging from our wide assortment of wrappings, and we’ll assemble it for you so you don’t have to lift a finger! 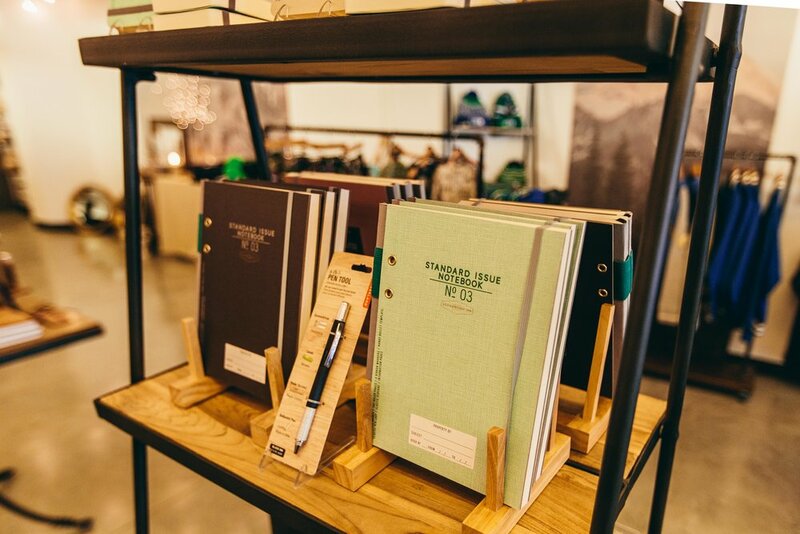 We’re your one-stop-shop for all things local--notebooks and bookmarks, mugs and shot glasses, bath and body, sports apparel… whether for an office gathering or the holidays, a birthday or simply some cool souvenirs, we’ve got you covered! So if you’re new to the city, or if you’ve lived here your entire life, come on in, grab some wine, and let us show you what Seattle is all about!